Here’s what’s up in the world of TV for Sunday, February 14. All times are Eastern. If ever an actor, a writer, and a director were destined to work together, it’s Cannavale, Winter, and Scorsese, and Cannavale’s all-consuming intensity shows the collaboration’s explosive potential. They’re clearly like-minded artists, and watching Vinyl is like hearing them drunkenly repeat stories Jagger told them at a stag party. But that’s precisely why Vinyl feels narratively hemmed in by its nostalgia. Boardwalk Empire took a more layered view of the Prohibition ’20s, whereas Vinyl’s main takeaway is that everything used to be cooler, sexier, and more fun. That message will resonate for some, and strike others as a sermon about the redemptive power of rock delivered directly to the choir. Regular coverage will come from Dan Caffrey, who will hopefully be better than your What’s On Tonight correspondent when it comes to torturing music metaphors. Bob’s Burgers (Fox, 7:30 p.m.): It’s been a painful drought on the Bob’s Burgers front this season, with new episodes mostly popping up when there’s an associated holiday. That trend continues with the show’s Valentine’s Day episode, where Gene’s desire to host the morning announcements may be jeopardized by a past relationship and Tina gets the chance to play Cupid at a fundraiser. Better watch your butts, Alasdair Wilkins cautions Wagstaff boys: Tina with a bow and arrow that she thinks causes love at first sight sounds dangerous. The Simpsons (Fox, 8 p.m.): The launch of the Frinkiac has officially made Professor Frink the master of the Internet, and tonight he turns his attention to also being the master of love by devising the perfect algorithm to match men and women. Dennis Perkins was on hand to present him the Nobel Prize in science for these achievements, but as this image from the award ceremony shows, it was a bittersweet experience. The Walking Dead (AMC, 9 p.m.): Speaking of marauding ghouls, The Walking Dead returns from its winter hiatus. As is de rigueur for this show, all hope is lost: Alexandria has fallen to the walkers, the Wolves are running around unchecked, and a new group called the Saviors have reared their heads under the leadership of a mysterious figure named Negan. Whose side are you on, Zack Handlen? Shameless (Showtime, 9 p.m.): With Lip getting embroiled in a scandal that drags him before the faculty disciplinary committee, Myles McNutt is gearing up to write at least 2,000 words for University Verisimilitude Corner. Shameless turned into a college drama so quickly we didn’t even notice. Frank will be filling the role of the campus quad lunatic. The Good Wife (CBS, 9:30 p.m.): In a Super Bowl filled with some of the least appealing commercials in recent memory (the phrase “garbage fire” was uttered more than once in your What’s On Tonight correspondent’s apartment) one of the few that stood out was CBS’s decision to use the platform to announce the final season of The Good Wife. It’s news so traumatic to Kayla Kumari Upadhyaya that she can’t even bring herself to review tonight’s episode. (She’s claimed travel plans, but we know better.) Her substitute Ben Phillipe will be there to help all of you through this difficult time. Billions (Showtime, 10 p.m.): “Axe unceremoniously disappears.” So you could say he’s been axed? Ah ha ha ha ha… Stop giving us that look, Joshua Alston. The Venture Bros. (Adult Swim, 12 a.m.): “The Monarch makes a bad first impression on Dr. Mrs. The Monarch’s co-workers.” Does The Monarch ever make a good first impression on anyone? He might have made one on Zack Handlen, but that could have been due to multiple-review-based sleep deprivation. The A.V. Club’s fourth-best show of last year, Better Call Saul, is back for its second season. 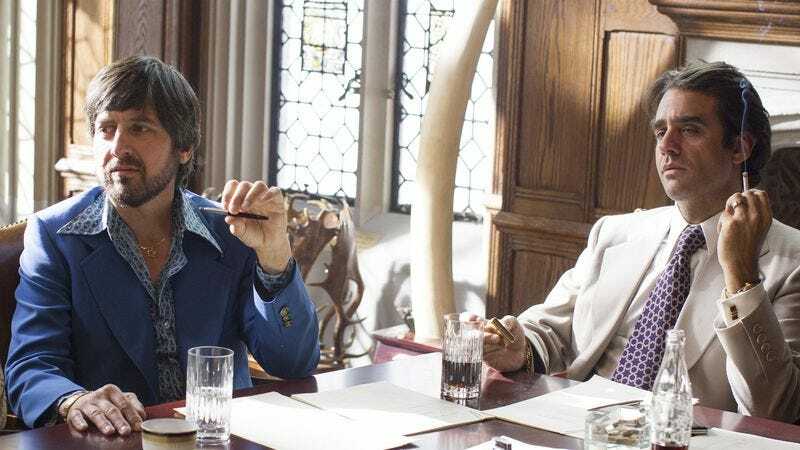 Once again we’ve retained the expert counsel of Donna Bowman to guide us through the triumphs and tragedies of one “Slippin’” Jimmy McGill, and we’ve called expert witness Joshua Alston for an Exhibit A TV Review on the first few episodes. Additionally, tomorrow marks the end of s summer at Gravity Falls, and Alasdair Wilkins will be there to enjoy his last day of camp. Gravity Falls creator Alex Hirsch also stops by for an interview with Gwen Ihnat’s twin children, The A.V. Club’s own Mabel and Dipper. Last Week Tonight With John Oliver (HBO, 11 p.m.): HBO’s triumphant return continues with the third season premiere of Last Week Tonight. Once again, John Oliver is there to report on all the stories that are deeply important and that Americans don’t notice because we’re too busy watching the umpteenth round of electoral slugging matches. Madam Secretary (CBS, 8 p.m.): During the Crosstalk discussion of Super Bowl 50’s commercials (which again, were ads your What’s On Tonight correspondent thought were 95 percent garbage fire), John Teti used the ad for Madam Secretary as his baseline. Can tonight’s episode, featuring a Saudi Arabian arms deal and stolen uranium in Eastern Europe, live up to that role? Bordertown (Fox, 9:30 p.m.): Bud gets involved in coaching high school football, and gets desperate to win a game by any means necessary. How desperate is he? He’s even willing to let that Lance kid on the team. CSI: Cyber (CBS, 10 p.m.): Tonight’s episode is not only called “The Walking Dead,” but is airing on the exact same night as the zombie drama of that same name has its midseason premiere. This is such a blatant effort to obtain a ratings boost by confusing viewers and DVRs that we have to respect it. In fact, it might be the smartest technology-related thing CSI: Cyber has ever done. Mercy Street (PBS, 10 p.m.): The hospital is thrown into disarray by the entrance of an unannounced inspector. But who’s the real inspector, and who are the patients just selling spoons and outboard motors? Oh wait, that was Fawlty Towers. Talking Dead (AMC, 10 p.m.): Chris Hardwick and his rotating couch of comedians, actors, and Walking Dead alums are back to once again shamble in the wake of the most recent episode. Tonight’s midseason premiere guests are executive producer Greg Nicotero, Nathan Fillion (Captain Tightpants himself), and a “surprise cast member.” Normally we assume this role falls to whoever winds up being that week’s zombie chow, but there’s one or two upcoming guest stars who could be making their first appearance tonight. The EE British Academy Film Awards 2016 (BBC America, 7:30 p.m.): The award show parade isn’t going to stop from now until the Oscars, and across the pond Bridge Of Spies and Carol are at the head of the nomination pack. It’s the 69th installment, which we’re not going to make a joke about but we assume host Stephen Fry will. He’s downright cheeky, Mr. Fry is. Curse of the Frozen Gold (Animal Planet, 10 p.m.): There’s gold in them thar hills! Cursed gold no less, in the form of a mine hidden deep in the British Columbia wilderness whose owner was hanged in the 1890s. Keeping Up With The Kardashians (E!, 9 p.m.): “Kendall receives an amazing opportunity, but worries that being a Kardashian will get in the way.” When has being a Kardashian ever stood in anyone’s way of anything, other than the inability to exist for ten minutes without Instagram? Abducted: The Jocelyn Shaker Story (Lifetime, 9 p.m.): Despite the misleading name, not a biopic about an actual abduction, just your basic Lifetime affair about a seven-year-old kidnapped from a Colombian resort. Just the thing to perk up this Valentine’s Day! Thor and Thor: The Dark World (FX, 8 p.m. and 10:30 p.m.): Thor: Ragnarok is still at least a year away, but FX wants to take you to Asgard nonetheless. Both films might not be in the top tier of Marvel’s cinematic universe, but were good enough to introduce audiences to one of that universe’s most endearing characters in Tom Hiddleston’s Loki. Captain America: The Winter Soldier (Starz, 9 p.m.): Between its high quality and its sequel premiering much closer, this is the Marvel viewing experience of the night. Plus, it’s the film that saved an entire network drama, and not too many films get to say that. Just Go With It (FXX, 7:30 p.m.): No, Adam Sandler, we don’t think we will. My Bloody Valentine (IFC, 8 p.m.): A remake of a 1981 horror movie that someone manages to be more romantic than any of the other films on tonight. Saturday Night Live: Virtually everyone from Gilmore Girls will be appearing in the upcoming new episodes, but poor Melissa McCarthy is still not one of them. She’ll just have to console herself with being a movie star, a career that offers the perks of hosting Saturday Night Live and being subsequently reviewed by Dennis Perkins.